A common notion holds that alchemists were eccentrics, lone practitioners working in dingy basements, cut off from the rest of the world. This was a myth already well established in Antonio Neri's time, but far from the whole truth. In the early seventeenth century, alchemy was practiced in medicine and pharmacy, in precious metals refining and even in the preparation of artists' supplies. Where Antonio Neri received his training is unknown, but there are intriguing clues. We turn first to Antonio's own father, Neri Neri, the royal physician to the Medici family. According to historian Giulio Negri, he received his medical degree at the prestigious Studio Fiorentino, the forerunner of today's University of Florence. At the time, it had already been in operation for two centuries, having been granted a charter in 1348 by Holy Roman Emperor Charles IV. The charter was a response to a personal appeal by Archbishop Piero Corsini. Antonio Neri's own distant relative, Ser Giovanni Neri, later became Corsini's secretary, so a family legacy of attendance is not out of the question. That our priest might attend his father's alma mater is pure speculation, but it seems foolish to doubt that he started his alchemy education at his father's knee, in his own home. 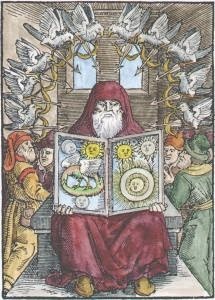 The manuscript entitled Treasure of the World that Antonio devoted to "all of alchemy" was completed in 1600, but started two years earlier. On a page near the beginning, dated 1598, the twenty-two year-old clearly identifies himself as a "priest." Church rules forbade anyone from becoming a novice before the age of sixteen, which for Neri would have been in the spring of 1592. Full ordination as a Catholic priest typically took six years, meaning in 1598 Neri only recently underwent the 'laying on of hands' ceremony by the archbishop, confirming his title. The inescapable conclusion is that Neri learned his craft while in seminary and the Church sponsored his education. The identity of Neri’s order is a mystery, but the few scattered pieces of the puzzle that we do have allow for some interesting speculation. The list of candidates having some connection to the priest and the means to support, if not supply an education is not long. The five names that stand out are the Dominicans, the Carmelites, the Augustinians, the Knights of Malta and the Benedictines. The Dominicans were noted for their scholarship and ran two apothecaries in Florence. The Carmelites are named in the deposition notes taken by Agnolo della Casa, which identify Neri’s confessor as such. The Augustinians counted a Francesco Neri as abbot of their San Clemente monastery who worked for Don Antonio de’ Medici at the Casino in 1619. Antonio’s aunt, Faustina, apparently entered an Augustinian convent after the death of her husband. Also, though Neri’s confessor was a Carmelite, he also served as the parish priest of an abbey run by the Canons Regular of the Lateran—an independent Augustinian congregation. The Knights of Malta ran two churches in Florence and Neri can be connected to both. The knights followed the rule of Augustine and enjoyed a close relationship with the Augustinians. The order traces its roots to the crusades and has various associations with alchemy such as George Ripley. Their main presence was on Malta, though in 1565 they suffered a devastating defeat there to the Ottomans. Neri was not a knight, but he could have occupied a place in their clergy. In Florence, any resources for schooling in alchemy by the knights would have been overseen by its most prominent local official; that official was Neri’s benefactor Don Antonio de’ Medici, Grand Prior of Pisa. The Benedictines were also associated with Neri’s family and had the means to provide him with an education in alchemy. He was born in the parish district of Benedictine church, San Pier Maggiore. His father was buried in the Cistercian (reformed Benedictine) church of Cestello. His sister committed to a Benedictine order (the Camaldolese). After his ordination, in 1601, Priest Antonio Neri lived across the street from the Vallombrosan (Benedictine) mother church, Santa Trinita. In any case, as royal physician Neri's father was an esteemed member of the court and Antonio would have enjoyed rare access to its inner sanctum. The grand duke's own laboratory at the Galleria dei Lavori certainly would have been a familiar haunt for our alchemist-priest. This post first appeared here in a shorter form on 2 October, 2013.